I might as well lay my cards on the table. I adore the playing of Arthur Grumiaux. The non-cloying sweetness of his tone, the laser-like intonation, the tight vibrato, the attention to delineation of structure, the remnants of old-fashioned portamenti tastefully applied, the thoughtful but innate-sounding musicality add up to playing by a giant. Both these recordings from the 70s have been issued before on Philips. They were back then recorded in quadraphonic sound but not many of us back then had the appropriate equipment for playback. The newish company, Pentatone, which is made up of old Philips types, is busily reissuing many of those old quad recordings in the new hybrid SACD format and this is one of them. 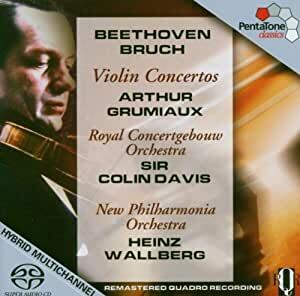 I must say that I don't hear much here to differentiate the Beethoven from the old Philips issue. And I never owned or heard the Bruch concerto in that format. But this I can say: both these performances are magisterial. 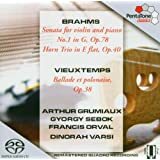 Not in the grand manner of, say, Oistrakh or Heifetz, but in the genial yet pristine style that identifies Grumiaux's playing. This is not heaven-storming Beethoven, but the playing is absolutely true to the score as I read it. His ability to convey the melancholy and pathos of the Beethoven is the best I know. I prefer it to the more grand symphonic presentation of other orchestras and soloists. The Bruch has become just about my favorite performance of all I own.